Smashing the Grass Ceiling is a women’s only series of golf networking events and skills clinics designed to encourage women of all skill levels to use golf to build relationships and gain confidence on the golf course. Want to take your game further? Smashing offers a variety of skill building workshops and retreats designed to make the game easier and more fun to play. Feel confident bringing colleagues, clients, friends and family to the course for some uninterrupted quality time together. Perfect for beginners to seasoned golfers. Build relationships and network in a fun relaxed nine-hole tournament! Get ready for upcoming corporate/charity tournaments and meet other professional women. Enjoy nine holes on course activities and lunch. Hear Far’s Rules for success in business and life! The Smashing program is a series of events ranging from 9 hole tournaments to clinics and retreats all designed to take the “scary” out of golf. 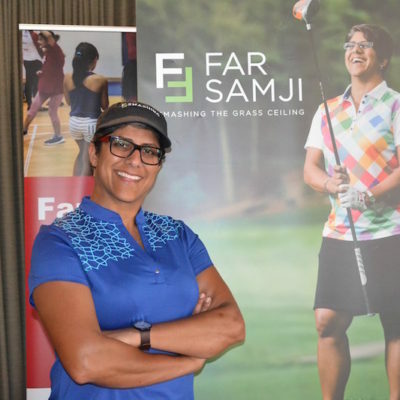 The intent is to get women out on the course and having fun, making connections and eventually hosting others for a round of golf. Networking has never been so easy. In this day and age we don’t have enough opportunities to make face to face connections and golf gives you a golden opportunity to have a conversation with someone and build a relationship. Smashing teaches you how to turn a golf game into an opportunity to make some magic happen. The day typically starts at 9:00 am with registration, followed by a group clinic at 9:30 am. We tee off at 10:00 am and are done golfing by 12:30 pm. Lunch and more networking follows, and we are wrapped up by 2:30 pm at the latest. If you find yourself avoiding golf events because you don’t have the confidence to play, then these events are perfect for you. Many women will play the entire circuit of events because it is so much fun and such a safe place to practice your skills. Registration begins at 9am – Shotgun starts at 10am. Lunch (included) at 12:30. Rental clubs available.